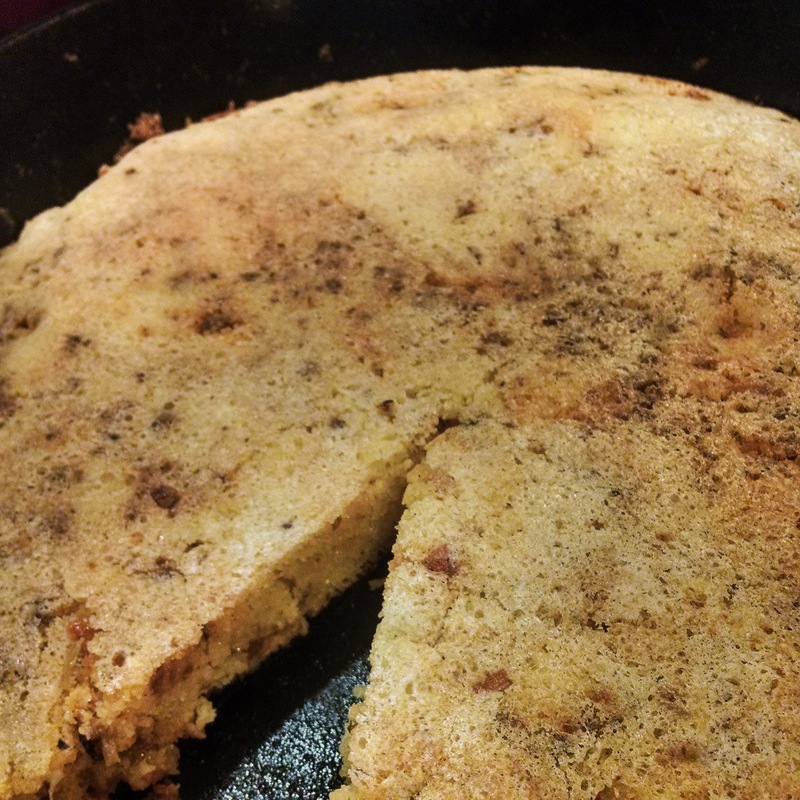 This corn bread can be a great side item or a main in and of itself! We enjoyed it with a side of braised brussels sprouts and green peas. I adapted the corn bread part of the recipe from the Pioneer Woman, but tweaked it. You could easily make it gluten by substituting gluten-free flour for the AP flour. Combine the cornmeal, flour, baking powder and salt in a bowl. Stir together. Measure the buttermilk and milk into a measuring cup and add the egg. Stir together with a fork. Add the baking soda and stir. Pour the milk mixture into the dry ingredients. Stir with a fork until combined. In a small bowl, melt 2 tablespoons coconut oil in the microwave (not too hot). Slowly add the melted shortening to the batter, stirring until just combined. Sautee onion and chorizo in a cast-iron skillet breaking up meat into small pieces. Cook until lightly browned. In the cast-iron skillet, melt the remaining 1 tablespoon of shortening with chorizo and onion mixture. Pour the batter into the hot skillet. (The batter should sizzle.) Spread to even out the surface. Cook on the stovetop for 1 minute, and then transfer to the oven and bake until golden brown, about 20 minutes. The edges should be crispy! Test with a toothpick in the middle for doneness. This entry was posted in Main, Recipes and tagged Danielplan, kidfriendly, maindish, recipes. Bookmark the permalink.